Event in Anchor & Den Restaurant - Grand Cayman - The Beach House Experience - TASTE THE BEST OF THE MED AT THE FINAL EDITION OF THE A&D PLAYGROUND! TASTE THE BEST OF THE MED AT THE FINAL EDITION OF THE A&D PLAYGROUND! At A&D, we love exploring, experimenting and having fun when it comes to dreaming up our next culinary adventure. We like to think we are a kid a play, letting our imaginations and creativity run wild to help inspire us in the kitchen! 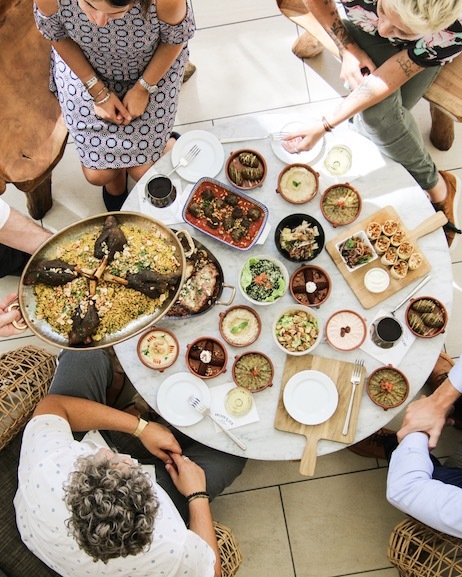 This week, we had a great time discovering the vibrant flavors of the Andes Mountains, where we offered guests amazing dishes inspired by the different elevations, including cuisines from Peru, Ecuador, Bolivia and Chile. For our final edition of the A&D Playground on Tuesday, 2nd of April, we will be tasting the best of the Mediterranean with our unique take on Aegean cuisine. Our Mezze Bar will offer mouthwatering dishes from this beautiful part of the world such as Babaghanoush, Falafel, Tabbouleh, Kibbe, Chicken Shawarma, plus so much more! 1. In the States, dinner is typically the large meal that families share together. For Greeks, that biggest meal is their mid-day meal, which they call mesimeriano. This is because shops and schools usually close down during the early afternoon, and everyone comes home to eat. They eat their mid-day meal a little later, around 2pm, since they do not eat dinner until after 9pm. 2. When you think of olive oil, Greece may be the first country that comes to mind. This is because Greeks use it on just about every dish. They dip their bread in it, mix it into salads, cook their meat with it, and put it on their cheese. Olive oil isn’t just tasty. It has a great range of health benefits, from reducing your risk of heart disease to reducing oxidative stress! 3. Rather than eating just the meat itself, Greeks tend to use the entire animal in their cooking. This includes the liver, brains, heart, eyeballs, and gut. Don’t worry; if you head to a Greek restaurant your meat dish likely won’t include these parts of the animal, but they are commonly found in families’ home cooking. We can’t wait to see you on the 2nd of April! Make sure to reserve your table soon by emailing hello@anchorandden.com. We are also asking our guests for feedback on which theme is their fave so make sure to tell us if you think our Flavors of the Aegean night rocks your world!